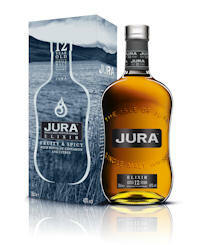 Jura distillery has today launched JURA Elixir, a new addition to its core range of whiskies. This fruity and spicy expression pays homage to local folklore which says that the island water, which goes into the whisky, has life-prolonging and mystical health-giving properties. Some even say it was blessed by St Columba around 560AD. Several Jura residents are reputed to have lived well into their hundreds, including one man who, according to his gravestone, lived to see 180 Christmases in his house on Jura. Jura Elixir is exclusively available to buy in Sainsbury’s stores nationwide from 17th November, priced at £16.49 per 35cl. Fruity and spicy with hints of cinnamon and citrus. Finished in a mix of American White Oak and Sherry casks, this combination of flavours includes crushed almonds, pineapple and fresh roasted coffee. The palate is rewarded with hints of citrus fruit, dark toffee and ginger spice. Off the west coast of Scotland lies one of nature’s best kept secrets, the Isle of Jura. Populated by a community of less than 200, known as Diurachs (the Gaelic name for the people of Jura), it is a place of myth, legend and intrigue – and an award-winning range of single malt whiskies which hold the promise of good fortune for all those that believe. There are four classic bottlings in the Jura Collection: Origin 10, Superstition, Diurach’s Own and Prophecy. Many of the Jura whiskies have their own distinctive drinking rituals, but one cuts across the range. Islanders believe that it brings good fortune to knock on wood before they drink a dram. “We have a tradition of drawing upon the island’s myths and legends as inspiration for our whiskies. And Elixir is no exception. We would never say that drinking whisky can make you live longer, but it’s not called the water of life for nothing you know!